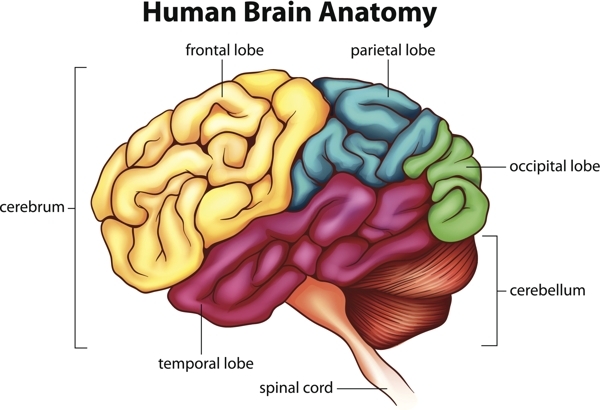 There are various ways of dividing the brain into anatomical regions. A conventional method of dividing the brain is by separating three main regions based off of the embryonic development; the forebrain, midbrain, and hindbrain. Within these divisions. The forebrain (or prosencephalon) consists of the cerebrum, thalamus, hypothalamus and pineal gland along with other components. Neuroanatomists refer to the cerebral area, the telencephalon with the term diencephalon ( or interbrain ) to identify the area where our hypothalamus, thalamus, and pineal gland are located. The midbrain (called mesencephalon) is positioned near the center of the brain between the interbrain and the hindbrain; it is formed by a part of the brainstem. The hindbrain ( rhombencephalon) composed of the remaining brainstem as well as the cerebellum and pons. Neuroanatomy calls this sub-region of the hindbrain, the myelencephalon while the metencephalon references the collective cerebellum and pons. Neurons, or tissue cells, are the cells that accomplish all of the communication and handling within the brain. Inflowing sensory neurons into the brain, from the peripheral nervous system, carry information about the condition of the body and its surrounding. Most of the neuron in the brain gray matter are interneurons, which are responsible for integration and processing data delivered to the brain by sensory neurons. Interneurons send a signal to motor neurons, which carry signals to muscles and glands. Neuroglia, or glial cells, function as the helper cells of the brain; they support and protect the neurons. In the brain, there are four types of glial cells: astrocytes, oligodendrocytes, microglia, and ependymal cells. Astrocytes protect neurons by filtering nutrients out of the blood an preventing chemicals and pathogens from leaving the capillaries of the brain. the communication speed of the brain. Microglia act , similar to white blood cells by fighting and eliminating pathogens that overrun the brain. Ependymal cells line the capillaries of the choroid plexuses and filter blood plasma to produce cerebrospinal fluid. Brian tissue can be broken down into two major categories: gray matter and white matter. Gray matter is made mostly of unmyelinated neurons, most of these are interneurons. The gray matter regions are areas in the nerve connections and processing. White matter consists mostly of myelinated neurons that connect with regions of gray matter to each other and the rest of the body. Myelinated neurons transmit nerve signal much faster than unmyelinated axons. The White matter acts as the information highway of the brain to speed the connection between distant parts of the brain and body. There are three mainstream structures of the human brain. The brainstem the brain to the spinal cord, this is the most inferior portion of the brain. 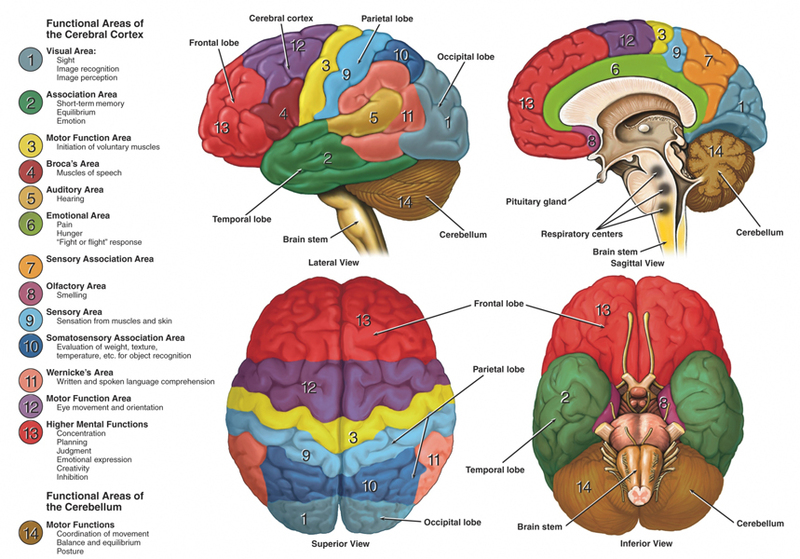 The brainstem controls several of the essential survival function of the brain. 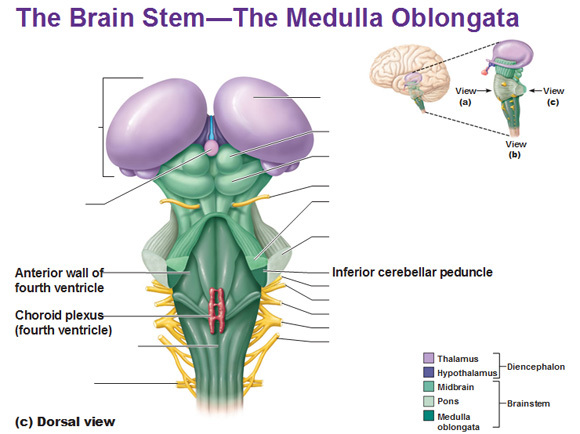 The brainstem is composed of three sections: the medulla oblongata, the pons, and the midbrain. A net-like structure of blended gray and white matter is known as the reticular establishment is located in all three regions of the brainstem. The reticular formation controls muscle tone in the body and acts as the change between consciousness and sleep in the brain. The medulla oblongata is similar to a cylindrically shaped mass of nervous tissue that attaches to the spinal cord on its inferior edge and the pons on its superior border. The medulla contains mostly the white matter that carries nerve signals ascending into the brain and descending into the spinal cord. Inside the medulla, there are several regions of gray matter that process involuntary body functions related to homeostasis. The cardiovascular nucleus of the medulla monitors blood pressure and oxygen levels and regulates heart rate to provide sufficient oxygen stocks to the body’s tissues. The medullary rhythmicity middle controls the rate of breathing to contribute oxygen to the body. Vomiting, coughing, sneezing, and swallowing reflexes are coordinated in the region of the brain as well. 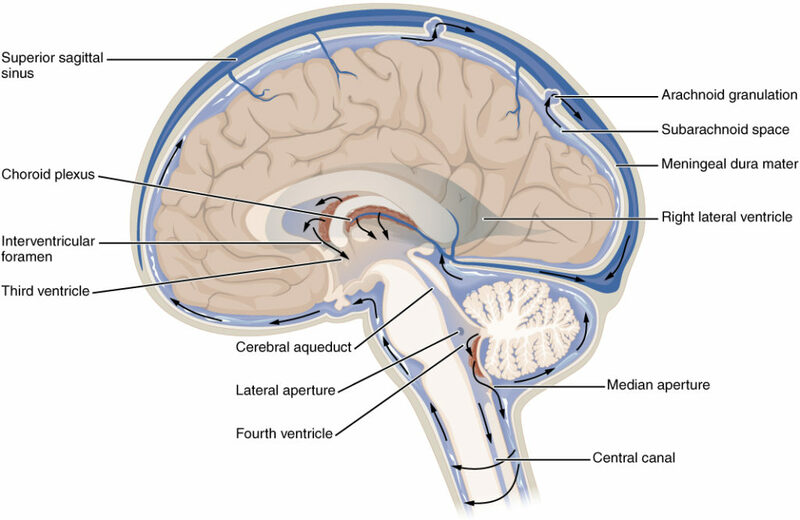 The pons is the section of the brainstem located superior to the medulla oblongata, inferior to the midbrain, and anterior to the cerebellum. Along with the cerebellum, it forms what is regarded as the mesencephalon. About an inch long and somewhat larger and wider than the medulla, the pins acts as the bridge for nerve signal going to and from the cerebellum and transmits signals between the superior areas of the brain and the medulla and spinal cord. The cerebellum is a crinkly, hemispherical region of the brain located posterior to the brainstem and inferior to the cerebrum. The outer layer of the cerebellum, know as the cerebellar cortex, is made of tightly wrapped gray matter that produces the processing power of the cerebellum. Deep to the cerebellum is a tree-like layer of white matter called the arbor vitae, which means ” tree of life The arbor vitae connects the processing region of cerebellar cortex to the rest of the brain and body. The cerebellum helps to control motor function such as posture and coordination of complex muscle groups. The cerebellum gets sensory inputs from the muscles and joints of the body and uses this formation to help the body maintain posture and balance. The cerebellum also controls the timing and finesses of complex motor actions such s walking, writing, and speech. The midbrain also referred to as the mesencephalon, is the most superior region of the brainstem. Located between the diencephalon and pon, the midbrain can be subdivided into two additional areas the tectum and the cerebral peduncles. The tectum is the posterior section of the midbrain, holding the relays for a reflex that consist of auditory and visual information. The pupillary reflex, which adjusts for light and intensity, the accommodation reflex, which focus on near and far objects and the startle reflexes that are among the various reflexes relayed through this region. The structure the anterior region of the midbrain, the cerebral peduncle may nerve tracts and the substantia nigra, Nerve tracts transient through the cerebral peduncles attach regions of the cerebrum and thalamus to the spinal cord and lower quarters of the brainstem. The substantial nigra is a region of dark melanin neurons that affect the inhibition of movement. Degeneration of the substantia nigra can lead to loss of motor control, which is referred to as Parkinson’s disease. Anterior and Superior to the midbrain is the region known as the interbrain or diencephalon. 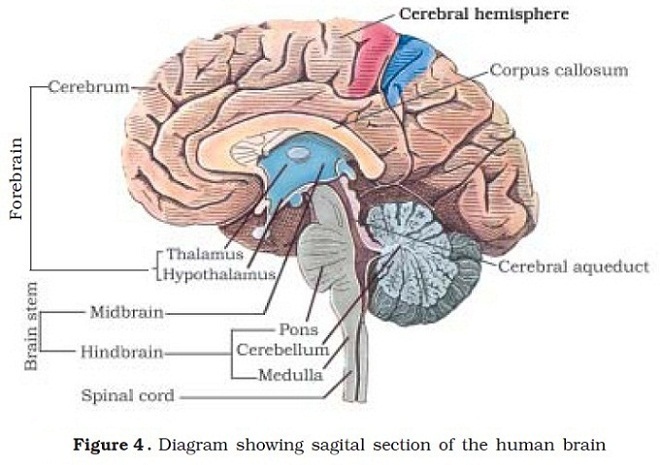 The thalamus, hypothalamus, and pineal glands make up the major regions of the diencephalon. The thalamus encompasses of a pair of oval masses of gray matter inferior to the lateral ventricles and surrounding the third ventricle. Sensory neurons that enter the brain from the peripheral nervous system form relays with neurons in the thalamus that continue on the cerebral cortex. IN this way the thalamus act like switchboard operator of the brain by routing sensory input to the correct regions the cerebrum cortex. The thalamus has and important role in learning by routing sensory information into processing ad memory center of the cerebrum. The hypothalamus is a section of the brain positioned superior to the pituitary gland and inferior to the thalamus. The hypothalamus serves as the brain’s control center for body hunger, their temperature, blood pressure, body temperature, heart rate, and production of hormones. In responses to change the condition of the body detected by sensory receptors, the hypothalamus sends signals to glands, smooth muscles and heart counteract these changes. An example in response to escalating in body temperature, the hypothalamus stimulates the secretion to sweat via the sweat glands in the skin. The hypothalamus also conveys signals to the cerebral cortex to produce the feelings of hunger and thirst when the body lacks food or water. These signals stimulate and conscious mind to seek out food or water to correct this situation. The hypothalamus also immediately establishes the pituitary gland by producing hormones. Some of these hormones, such as oxytocin and antidiuretic hormone, are constructed in the hypothalamus and deposited in the posterior pituitary gland. Other hormones, such as delivering and inhibiting hormones, are secreted into the blood to stimulate or inhibit hormone generation in the anterior pituitary gland. The pineal gland is a small gland positioned posterior to the thalamus in a sub-region called the epithalamus. The pineal gland produces the hormone melatonin. Light heating the retina of the eyes send signals to inhibit the function of the pineal. When light is not hitting the pineal gland, it secretes melatonin, which has a sedative impact on the brain and helps to cause sleep. This function of the pineal gland helps to illustrate why darkness is sleep-inducing, and light tends to cause sleep disturbance. Babies produce higher amounts of melatonin, allowing them to sleep as long as 16 hours per ay. The pineal gland provides less melatonin as people age, resulting in difficulty sleeping during adulthood. The biggest region of the human brain, our cerebrum commands higher brain functions such a language, logic creativity, and reasoning. The cerebrum encompasses the diencephalon and is located superior to the cerebellum and brainstem. A deep furrow identified as the longitudinal fissure runs midsagittally down the center of the cerebrum, divided into four lobes, which are the: frontal, temporal, parietal and occipital. The lobes are designated for the skull bones that covers them. The outside of the cerebrum is a convoluted layer of gray matter associated with the cerebral cortex. Most of the processing of the cerebrum occurs within the cerebral cortex. The bulges of the cortex are called gyri while the indentations are called sulci (singular: sulcus). Deep to the cerebral cortex is a cover of cerebral white matter. White matter contains the connections between the regions of the cerebrum as well as between the cerebrum and the rest f the body. A brand of white matter called the corpus callosum attaches the left and right hemispheres of the cerebrum and allows the hemispheres to interact with each other. 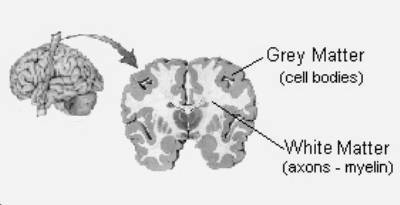 Deep inside the cerebral white matter are certain regions of gray matter that composes the basal nuclei and the limbic system. The basal nuclei, including the striatum,globus pallidus, and subthalamic nucleus, work collectively with the substantia nigra of the midbrain regulate and control muscle movements. Specifically, these areas help to control muscle tone, posture, and subconscious skeletal muscle. The limbic system is another group of deep gray matter regions, including the hippocampus and amygdala, which are involved in memory, survival, and emotions. The limbic system assists the body to react to emergency and highly emotional situations with fast, almost involuntary actions. With so many vitals functions under the control of a single incredible organ – and so many important functions carried out in its layers – how does our body protect the from brain damage? Over skull apparently offers quite a bit of protection, but what protects, the brain front the skull itself? Three layers of tissue, collectively identified as the meninges, surround and protect the brain and spinal cord. The dura mater makes the leathery, outermost layer of the meninges. Dense irregular connective tissues made of tough collagen fiber gives the Dura matter forms a pocket throughout the brain and spinal cord to hold the cerebrospinal fluid and prevent mechanicals damage to the soft nervous tissue, The name Dura matter comes from the Latin form tough mother due to its protective nature. The arachnoid mater is located lining the inside of the dura mater. 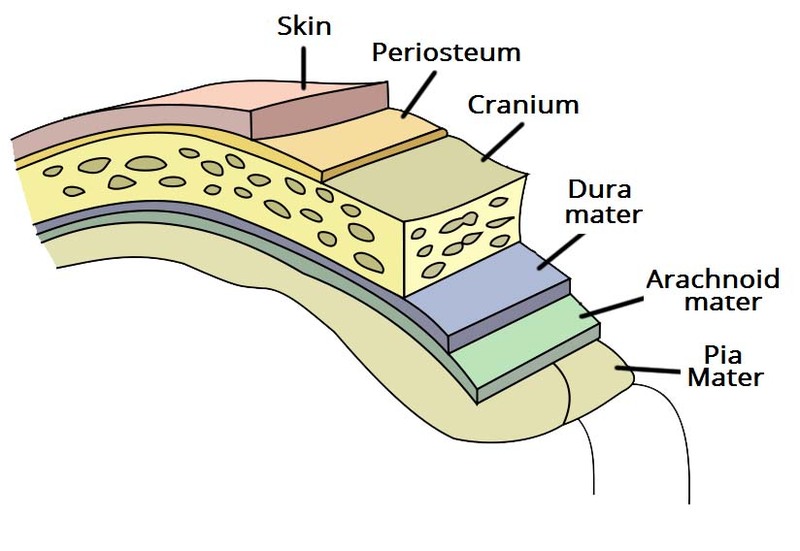 Much thinner and more sensitive than the dura mater, it contains many thin fibers that connect that dura mater and pia mater. The name arachnoid mater comes from the Latin word spider-like mother’ as its fiber resemble a spider web. Beneath the arachnoid mater is fluid-filed region known as the subarachnoid space. As the innermost of the meningeal layers, the pia mater rest directly on the exterior of the brain and spinal cord. The pia mater’s numerous blood vessels produce nutrients and oxygen to the nervous tissue of the brain. The pia mater also helps to coordinate the flow of materials from the bloodstream and cerebrospinal fluid into the nervous tissue. Cerebrospinal fluid (CSF) a clear fluid that surround the brain and spinal cord provide many essential functions to the central nervous system. Rather than being firmly anchored to their enclosing bones, the brain and spinal cord float within the CSF. 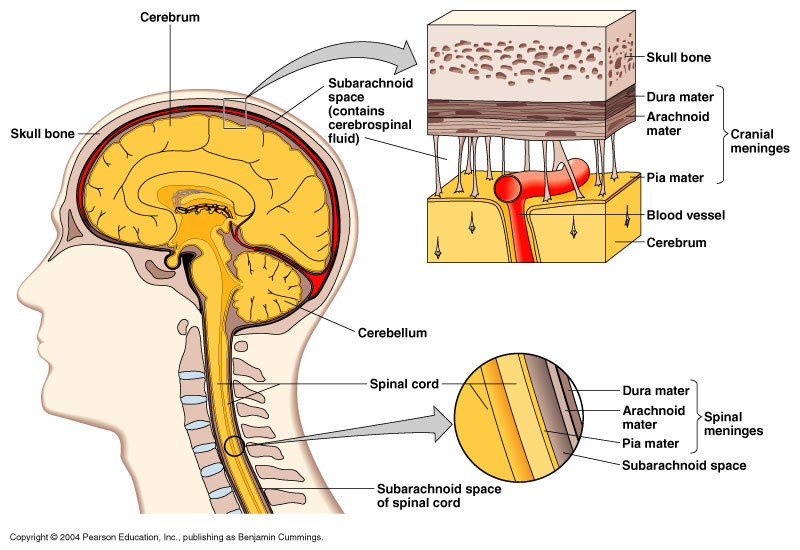 CSF fills the subarachnoid space and exerts tension on the surface of the brain and spinal cord. The pressure of the CSF acts as a shock absorber and stabilizer for the brain and spinal cord as they drift within the hollow spaces of the skull and vertebral. Inside of the brain, small CSF -filled cavities called ventricles expand under the pressure of CSF to lift and the soft brain tissue. The following circulation around the brain the spinal cord, CSF enters small formations known as arachnoid villi wherever it is reabsorbed into the bloodstream. Arachnoid villi are the fingerlike extension of the arachnoid mater that passes trough the dura mater and into the superior sagittal sinus. The superior sagittal sinus is a vein that runs throughout the longitudinal fissure of the brain and provides blood and cerebrospinal fluid from the brain back to the heart. While the brain only weighs about three pounds, it consumes as much as 20% of the oxygen and glucose in the body. Nervous tissue in the brain has a very high metabolic rate due o the vast number of processes and decisions that take place instead the brain at any given time. Large volumes of blood must be continually delivered to the brain to maintain proper brain functions. Any interference in the delivery of blood to the brain can immediately result in dizziness, disorientation, and unconsciousness. The brain regulates nearly every movement in the body. An area of the cerebral cortex called the motor area send a signal to the skeletal muscles to create all voluntary actions, The basal nuclei of the cerebrum and gray in the brainstem assist in controlling these movements subconsciously and preventing extraneous motions that are undesired. The cerebellum assists with the timing and coordination of these movements during complex motions. Cardiac muscle tissue, smooth muscle tissue, and glands are stimulated by motor outputs of the autonomic regions of the brain. After sensory information has entered the brain, the related areas of the brain start to process and analyze this information. Sensory information is connected, evaluated and compared to prior experiences, to provide the brain with an accurate understating of its conditions. The associated areas also work to develop plans of action that are sent to the brain’s motor region to produced change in the body through muscles or glands. Associated areas work to create our thoughts personality and plans. The brain requires storing various types of information that it receives from the senses and that it creates through thinking in the associated areas. Information in the brain can be stored several different ways based on the source and how long the information is needed. The brain maintains short-term memory to keep track of task and actions the brain is currently involved. Short term memory is believed to coins of a group of neurons that spur one another in a loop to save data in the brain’s memory. New information can replace old information within a few seconds or minutes in short term memory unless this information is moved to long-term memory. Long-term memory is stored in the brain by the hippocampus. The hippocampus transfer information from short memory storage regions of the brain, particularly in the cerebral cortex of the temporal lobes. The memory associated with motor skills or procedural memory is stored by the cerebellum and basal nuclei. The brain controls the body by maintaining the homeostasis of various unique functions such as the heart beat, breathing, hunger and body temperature. The hypothalamus and brainstem are the brain formations most concerned with homeostasis. The brainstem, the medulla oblongata contains the cardiovascular center that monitors the levels of dissolved carbon dioxide and oxygen in the blood. As well as blood pressure. The cardiovascular center changes the heart rate and blood vessels dilation to maintain health levels of dissolved gasses in the blood and to maintain a healthy blood pressure. The medullary rhythmicity center of the medulla monitors carbon dioxide and oxygen levels in the blood and adjust the rate of breathing to keep theses levels balances. The hypothalamus controls the homeostasis of the body’s temperature sleep, thirst, hunger and blood pressure. Many autonomic sensory receptors for pressure, chemicals, and temperature feed into the hypothalamus. The hypothalamus processes the sensory information that it receives and sends the outpost to autonomic effectors in the body including the heart, kidneys and-and the sweat glands. While sleep may seem to to be a time of rest of the brain, this organ is extremely active during sleep. The hypothalamus maintains the body’s 23-hour biological clock, know as the circadian clock. When the circadian clock registers that the time for sleep has arrived, it sends signals to the reticular activating arrangement of the brainstem to reduce its stimulated of the cerebral cortex. Reduction in the stimulation of the cerebral cortex lead to a sense of sleepiness and eventually leads to sleep. In the sleep state, the brain stops controlling consciousness, reduces some of its sensitivity to sensory input, relaxes skeletal muscles m and completes many administrative functions. These administrative functions include the consolidation and storage of memory, dreaming, and development of nervous tissue. There are two central stages of sleep; rapid eye action (REM) and non-rapid eye change ( NREM), During REM sleep, the body shifts paralyzed while the eyes move quickly back and forth. Dreaming is prevalent during REM sleep and is believe that some memories are collected during this phase. NREM sleep is a stage of slow eye movement or no eye movement, finishing in a deep sleep of low brain electrical activity. Dreaming during NREM sleep is uncommon, but memories are still processed and stored during this time. Reflexes are fast, involuntary reaction to a form of internal or external stimulus. Many reflexes in the body are integrated into the brain, including the pupillary light reflex and sniffling clear the airways of the lungs. Different reflexes help the body react to stimuli, such as bright or dim light adjusting the pupils. All reflexes happen immediately by bypassing the control core of the cerebral cortex and integrating tin the lower region of the brain such as the midbrain or limbic system.